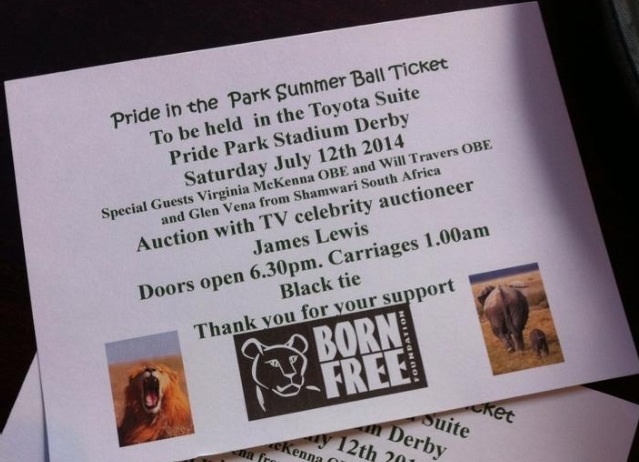 If you can’t see from this hurriedly taken photo of my Pride in the Park tickets, I’m headed to Derby for a fantastic and glamorous evening of entertainment and auction as part of Born Free Foundation’s 30th anniversary celebrations. I even dusted off my coloured pencils and did my first piece of art work in two years for the occasion! As a prize donation to the raffle, I created this image of a leopard, based on a photo I took of Born Free’s Kuma when I was out in Shamwari – obviously I have a bit of artistic license, and I draw free hand rather than tracing or ‘squaring-up’, I’m not claiming this leaopard drawing actually looks like Kuma – or is supposed to be him, it was just a great resource for the drawing. The second exciting part of my weekend – on the theme of art – will be a trip to the opening of Pollyanna Pickering’s exhibition as part of the Born Free Foundation Celebration Day on Sunday. I’ve been a fan of Pollyanna’s work since the days I used to subscribe to a beautiful magazine called Wildscape, specifically exploring and celebrating wildlife art. It’s going to be an awesome 24 hours – can’t wait to tell you all about it on the other side!